Last week, Blockchain masterminds gathered for three events in the Bay Area: Blockchain Protocol Analysis & Security Engineering Conference, CoinDesk’s Construct Conference, and Hyperledger’s Hackfest. All the events demonstrated that blockchain technology is becoming more mature and forming an emerging industry of startups and enterprise players. On January 29-30, Stanford University hosted a deeply scientific conference on the security and systemic risks in blockchain protocols through the use of formal methods, empirical analysis, and risk models. Brilliant presentations on modern trends in consensus algorithms and communication protocols ensued open conversations among cryptographers representing various distributed ledgers. The conference succeeded to foster multidisciplinary collaboration among practitioners and researchers. Among the participants, companies presenting various efforts built on top of Hyperledger’s technology included HACERA, Skuchain, and IntellectEU. HACERA was presented at the second part of the talk “Permissioning Your Blockchain: How to Overlay Hyperledger Fabric with a Fully Workable System Tapestry” at the event. 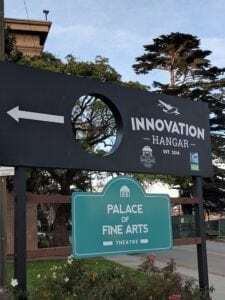 After an unusually warm weekend in San Francisco, a group of 350 technical blockchain experts headed to the Innovation Hangar. At the invite-only CoinDesk’s Construct Conference, participants heard the latest updates from CTOs of leading Blockchain initiatives, saw live product demos, and were able to install environments for protocols and projects that were new to some. Hyperledger frameworks including Fabric, Sawtooth Lake, and Iroha had dedicated sessions presented by Chris Ferris, Mic Bowman and Makoto Takemiya, respectively. 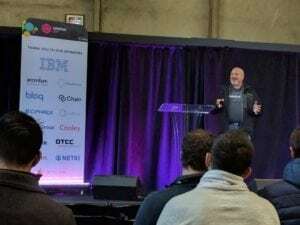 Brian Behlendorf, Executive Director of Hyperledger, delivered an update on the “Modular Umbrella Approach,” which included new efforts like Cello, and existing projects like Chaintool and Blockchain Explorer. Everyone that was interested in Hyperledger Fabric could witness a trading marbles demo in a separate dedicated pavilion. While those events were a real treat for all Blockchain professionals, the Hyperledger Hackfest was the cherry-on-top. 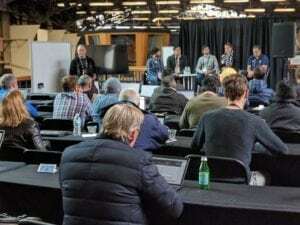 It gathered 80 Hyperledger enthusiasts and core developers at the Presidio on February 1-2. Both days were filled with project activities, updates, and work group meetings on coding and support. During the Hackfest, Iroha and IBM even announced their collaboration. The Hackfest featured two working groups: Architecture WG and Identity WG. The highlight had to be a presentation that introduced an application framework designed to simplify and expedite the creation of Hyperledger blockchain applications with additional business logic on top often referred to as “smart contracts” – Fabric Composer. The consensus for all the three events is that Blockchain is here to stay. While 2016 was named the year of Proof of Concept, 2017 promises to be a year of Pilot. The Blockchain ecosystem across companies and industries unites efforts to address scalability and privacy challenges. It is acclaimed that the Hyperledger community plays a notable role in this game.